Exotic Handmade Paper Envelopes, manufactured entirely by hand by using Cotton Rag Handmade Metallic Papers ,.We can provide these papers in assorted colors Handmade Paper envelopes have their own charm and appeal, unlike machine made envelopes, our envelopes are ideal for wedding stationery and correspondence stationery, your recipients will love what they receive . We manufacture a large range of Handmade Paper in a variety of shades and colors in 100 GSM, ., Our papers for the envelopes are eco-friendly as they are made from Cotton Rag Pulp. Envelopes can be manufactured in any size specif cation that you need and can be further customized with your logo or branding as required. All our envelopes are handmade by our artisans, they are hand folded and hand glued. You are thus buying an entirely handmade Product, we are looking forward to receive bulk inquiries only. We can also emboss your logos or provide Foil Stamping, Screen Printing as per your specifications, Our Handmade Paper Envelopes are also available with Deckle Edges . We also make Handmade Paper Envelopes in Silk Fibers. You can also purchase envelopes with Sticker Gumming and Peel and Seal. .. We also try and understand your requirement, our client service team helps you get packaging that actually meets your needs, we just do not make Paper Envelopes we try and understand what exactly you need. 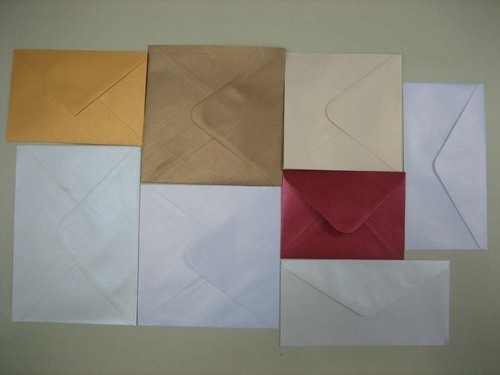 We supply a large range of Handmade Paper Envelopes to Gift Shops, Stationery Shops and Corporate, and Wedding Stationers.